Today was our Broads & Books Book Club Meeting. The book we discussed is The Kindness of Strangers by Mike McIntyre. The theme of the book captured me right away. I always try to see the kindness in others and I believe people are inherently good. This book is a non-fiction work about the author, Mike McIntyre, who decides to face his fear of life in general by quitting his job and traveling across the United States with no money and being wholeheartedly dependent upon the kindness of strangers on his journey. I believe the biggest factor with fear is a lack of knowledge and understanding on the subject that causes the fear in you. Mike McIntyre decided to conquer his fear that has ruled his life by becoming completely dependent upon strangers. The author leaves his job, girlfriend, and the city he lives in for the unknown world of America. The leap of faith Mike McIntyre took in trusting that he would find kindness from strangers along his journey is a big leap. He is dependent upon unknown people who are willing to show kindness to make this journey a success. Great concept, right? Sounds amazing, yes? Well it is not, at least not in the way the author has written this book. 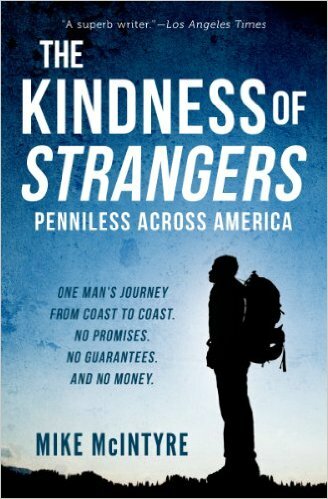 The book, The Kindness of Strangers (penniless across America), left me feeling disappointed. Throughout the book, I just felt like I was reading the notes from the author that he took because the stories he told in the book were written with a detachment by the author. He seemed to have no connection with the stories that he told aside from witnessing them. I felt the author exuded a bit of an ego and kept with his stereo-typical assumptions of people that he has formed throughout his life. There were only a few moments of epiphany that the reader felt in the book, but those moments were few and far between. There were moments of brilliant writing and statements in the book, however, I think the author damaged his story by looking through his journalistic lens instead of actually living in the moment of the experiences he came across. This story does help open the reader’s eyes to a different world that they may not be familiar with and does help give a little hope for the people in this world. A hope that not all we see and hear is evil and crap in the world. There are truly kind people who would not think twice about assisting a stranger that is in need. I like this fact because all too often people have a jaded view of the world we live in and it saddens my heart. I love the world I live in and appreciate the people I have the pleasure of coming across along my own personal journey in life. I give The Kindness of Strangers by Mike McIntyre 1 out of 5 Bookmarks, Dear Bloggites. I do not recommend this book for you to read. Hopefully his other written works are better than this one.